Gps altitudes are measured from a different datum then baro altitude so its not a valid comparison between the two (apples to oranges). There will be a greater delta between the two as you increase altitude. Cool you explain further? The antennas are mounted in different places for the GPSs, but that is obviously not what you mean. I agree, but I am not certain I can get an AGL reading from my GPS. It shows things in colors in reference to the airplane GPS altitude and what I would assume is altitudes based on sectional data. Because of that, I doubt AGL is available. Others may know different, however. Oops, I was responding to SportPilot. Interesting article Anticept. I wonder 1) if anything has changed in the dozen years since the article was written, and 2) how closely ground altitudes are colored in relation to the aircraft altitudes? Its worse than useless its wrong, they are not supposed to match. This same topic came up in another forum. I think you're wrong here. That will only occur on the surface with a correct altimeter setting. As soon as you start climbing, pressure will drop, but rarely at a standard rate. Think of it like standard temperature at SL - we use 59°, but it's rarely actually 59°. And SL pressure is rarely 29.92. Similarly, the pressure rarely drops at the standard 1" per thousand feet or so. Also, non-standard temps can effect indicated altitude. When one is flying, one is using indicated altitude, which will only rarely coincide with true or GPS altitude. But that's not important, as long as everyone is using indicated altitude, everyone will still have the required separation from each other. All this is below 18,000' of course. Above that it's pressure altitudes, which bear even less semblance to how high you really are. And it matters just as little (most of the time). I think I kept my terms and physics consistent above. Hope it was clear - and accurate! How do you configure a GPS altitude readout to be based on AGL? Just offhand, I don't see AGL as a display option on the Garmin 496 - others will have to speak up on other receivers. Interesting. It is based on subtracting the terrain data base elevation from the GPS altitude, I take it. It is a constructed rather than direct reading. Some apps calculate AGL I assume by subtracting the sectional ground elevation below from the GPS altitude. I can get AGL using IFly GPS or Naviator, one or the other or both, I don't remember. I NEVER us GPS altitude to fly the airplane. I don't either unless it is giving me a warning for terrain or obstacle. 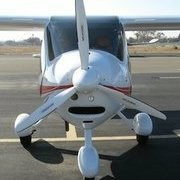 Flying VFR day and over mostly flat land it is not often am issue. I also have no desire to add a fourth screen to the cockpit. I do have a visual representation of the terrain which, I believe must work in a similar manner. What about vnav on the Garmins? I know some off you use that. Is it accurate enough? Once a device "knows" the elevation of the terrain below it, and the plane's approximate true altitude (GPS-derived), it's a simple matter of subtraction. The 496 clearly does that "behind the scenes", but as far as I can determine only shows it via color coding of terrain clearance. Wing-X displays AGL and altitude and I find them fairly accurate. The model has evolved a bit since then with GEOID12A being the latest model. Altitude accuracy is within 2 meters. Yes, that is certainly true. So, how is the crosswind calculated and headwind calculated on the EFIS? P.S. Thanks to all for not reposting Burgers. It is much easier to ignore him. and as we are flying along they are madly twiddling the dials to compute all that lovely information for us! What really happens is that the little elves inside the Dynon . . . . . and as we are flying along they are madly twiddling the dials to compute all that lovely information for us! Finally . . . someone has broken the code!